L. minors can be observed actively hunting on open ground during sunny days. Ground Mantids have only been observed hunting either on the ground or on small shrubs a few centimeters above the ground surface. As with all mintids, the front legs of L. minor are highly developed to grab and hold prey. The 4 spines on the fore femur and the spines on the tibia are developed to close on prey with lightning speed, holding prey in a vice grip, while the highly developed mandibles begin eating prey alive. 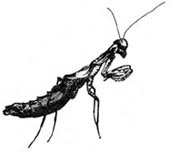 Nymphs can sometimes be cannibalistic as with most mantids, and begin hunting their first day. Young feed mainly on small flies, but as they grow, they will hunt down and attack anything that they can. L. minor is a solitary species and like most other praying mantises will only come together to mate. Particular mating times for this species is highly dependant upon both weather conditions for that year, and prey availability. Typically however it has been observed that females, 2 weeks after their last molt are most likely to accept a mate, and have a successful clutch. Male Ground Mantids will detect a female by following a pheromone released by a sexually mature female. Once a male has located a female, he slowly approaches her, being sure to distinguish himself as a mate and not a prey item (at least not for now), and quietly hops on the females back. L. minor is an extremely aggressive species and the female may sometimes mistake the potential mate for prey, and attack and eat the male. Once successfully on the back of the female, the male L. minor will bend his abdomen down, attaching his spermataphore into the females spermatheca. Canabalism during mating can be observed in many different species of mantids (usually 6-30% of the time) and Litaneutria minor is no exception, with nearly all females eating the males head during mating. This unusually high percentage of cannibalism during mating is not common in most mantid species. Babies emerge from ootheca in the early spring and begin growing immediately. Females will molt approximately 7 times, with their terminal molts being in mid to late summer. Males will molt only 6 times and will have a terminal molt mid to late summer also. Babies and juveniles spend all spring and early summer catching as much prey as possible and growing in size. Litaneutria minor uses its small size and dark coloration as its best defense against predators. Because of its dark coloration, it easily blends in with the small rocks, broken twigs and dark vegetation found in its territory. Its small size easily allows it to quickly run and hide under rocks or dense vegetation. The Agile Ground Mantis is noted as being extremely aggressive, and has no problem defending itself against predators or unruly prey. It will extend its forearms out fully and stand as tall as possible to try and intimidate predators. This page was last modified on 17 May 2010, at 14:03.